"Metal Men" - Part 1: "We, Robots!" Metallo attempts to rob a Waynetech Research Center and kills several members of the security team in the process. After a confrontation with one of the widows Bruce believes that for the safety of his people that he needs to start thinking outside of the box. Meanwhile Doctor Will Magnus decides to take his Metal Men public by breaking into another Waynetech facility. 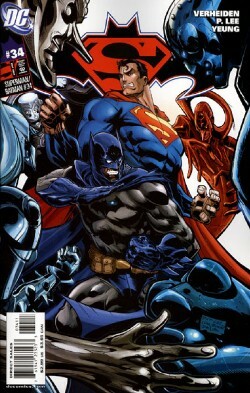 Once Superman and Batman get word of the break-in they race to the scene and engage the Metal Men in combat. Magnus steps forward and identifies himself. He informs Batman that his Metal Men have taken control of the facility and that no one has been hurt. When Batman rather snidely brushes his comments off and asks what Magnus wants the doctor admits that he is kind of new at this but figures now is the time for negotiation. Story - 4: You know, I rather liked this issue. The story was solid, I liked the new versions of the Metal Men and the focus seems to be more on Batman at the beginning of this story arc, which balances against the Superman heaviness of the last arc. I just have one small question. How the heck do Superman and Batman not know who the Metal Men and Will Magnus are? I'm not asking out of spite nor do I believe that the entire story, complete with plot twists and dramatic transitions, should be laid out in the first chapter of the arc. There may be a valid explanation for what transpired inside this book, but right now all I can think of is the fact that we just had about fifty issues of a weekly series where Will Magnus figured prominently in addition to the number of times Superman has teamed up with the Metal Men going all of the way back to the earlier issues of DC COMICS PRESENTS (which was reprinted recently in the BACK IN ACTION trade). It occurred to me that these guys may have run into each other a few times. It's kind of confusing, but not in a "hey, this is kind of weird but I want to see how it plays out" sort of way. This is an annoying, "bring out the continuity cop in me" type of deal. I tend to go back and forth on how important continuity is in the books I read. There are days where I couldn't care less and others where I want a solid background to draw upon and whoa be to the creator who deviates from the course. Frankly I think that the answer lies somewhere in the middle, but I'm a rather moody comic fan so I never know how something will hit me until it comes to pass. This is one of those times where I am frustrated with what seems to be yet another needless revamp. Don't get me wrong. I like how Verheiden treated the Metal Men. They've never been my favorite but the overall concept is kind of goofy and they're fun. I even liked the introduction of Copper as well as the fact that Gold is just a head, which leads me to believe that Magnus couldn't afford to build the rest of him. Seeing the Metal Men interact with each other and Helen added a lot of character to the issue. I also liked the inclusion of Metallo since he has ties to the first story arc of this title and he's a robot (or cyborg I guess), which fits into the general feel of the story. So the story itself wasn't the problem. After my general disappointment from the last issue I was looking forward (how's that for some odd logic) to seeing what Verheiden had next as I believed the previous arc was just a fluke. Verheiden delivered a solid introductory issue complete with cliffhanger ending. It's just that darn continuity that is getting in my way. Look, I understand this is still kind of an all new, all different DCU. All of the events of 52 have not played themselves out. I don't know what is going to happen. If slight changes are made to streamline the universe so be it. If, however, the powers that be have decided that they are going to take out whole sections of the previous continuity in favor of reintroducing concepts fresh and new then they haven't learned the mistakes of the Post-Crisis DCU. Sure some things worked out. Superman and Batman had some great re-boots as did Wonder Woman, but then you had things like Hawkman and things get muddled. To decide that this is the first time the Metal Men ever appeared and not give us a sense of when this story takes place the chances are high that people who are even more steeped into continuity than I am are going to get their noses out of joint. Aside from angry fans, which I think we can all agree don't have much of an impact on the books themselves, it is a slippery slope that can lead to ten to fifteen years from now someone coming along and doing it again. And the more it's done the easier it is to do again. I am fully aware that all might be explained in the next few issues. These are simply my thoughts on the here and now. I am enjoying the story but at the same time I have some questions about what fits where, which I think is valid. Still, I liked the Metal Men in this issue. I'm not a true fan, but Verheiden did a good job with them and I liked what he did with the Batman. I'm a little confused how Metallo was able to hurt Superman if he isn't Kryptonite powered, but some things you just roll with. Art - 4: Well, if you're going to have robots Pat Lee is the man to get. The Metal Men looked fantastic in this issue. I don't think they have ever looked as cool as they do here, which went a long way to making me like them even more. All of that had distinctive looks with lots of great detailing work. Metallo looked pretty good too and the melting appearance sold Gordon's bit of dialogue that the cyborg was starting to get a little ripe. Lee also did a great version of the Batman, but I'm not quite sold on his Superman as of yet. There's something a bit off about his rendition of the Man of Steel but I can't quite put my finger on it. So great Metal Men, fantastic backgrounds, dark and moody art, dark and moody Batman, so-so Superman. All in all a satisfying bit of comic book art. Cover Art - 5: I see this cover and suddenly Carl Douglas is filling my head. Sing it with me now; "Everyone was kung-fu fighting. Those cats were fast as lighting. In fact it was a little bit frightening. They had expert timing." All right, I'll stop, but that is one retro-martial arts stance Batman is sporting. The cover to this issue was fantastic. It really served to get me excited about the issue and I thought that despite Batman's odd stance he and Superman were very iconic and the Metal Men were pretty darn cool as well. It's nice to be completely satisfied with a cover on this title.